While some parts of the world are still experiencing cold weather, we here have been feeling the hot summer sun more and more these days. Every morning, I keep looking for outfits in lightweight fabric to keep me cool for the rest of the day. (And no, I don’t mean figuratively. But then again, that is debatable. LOL!) I just couldn’t bring myself to wear anything thicker than a feather. Okay, fine. Maybe I’m exaggerating, but you know what I mean. Thank God stores are done with fall/winter clothes. Time to bring on the Spring/Summer goodies! Just like Abercrombrie & Fitch’s new collection featuring spring dresses, rompers and maxis. This particular romper called the Elsie dress is my favorite. Nothing says feminine than these pretty frills and laces. And can you see the little eyelet details and scalloped hem on the bottom? J’adore! It’s great that this romper is cut higher than usual as well. They make my legs look extra long–as if I’m wearing sky-high heels. That’s what I like about A&F’s clothes. They’re simple but always so beautifully made in the right silhouette and cut to ensure a flattering fit. And you know what they say about anything that fits right, it will always look 10 times better than the fanciest ill-fitting clothing you have. I can already tell I’ll be overusing this romper for the rest of summer. If you’re looking for clothes to wear this spring summer season, I suggest you head on over to Abercrombie & Fitch as well. More breezy and lightweight designs in superb quality cotton awaits! What size denim jacket are you wearing? Gasp* you’re not wearing a necklace. I remember when you used to pile them on too. You look tanned here! Love the romper Cams! Double time na ako sa pagpapayat this summer! hahaha… Thinspiration kita, infairnesss! Oh! Never thought I’d be someone’s thinspiration! How flattering :) Thanks Reena! Go, go go! I support you! love your rompers and the shoes too. :) super ganda ng detail sa romper mo. :) btw, have you seen h&m spring/summer campaign? Yes! With just the studs, you know they’re Valentino! :) Thanks Ren! Spaghetti strap rompers are easier! :) You just have to pull it down! :) LOL! Believe me when I say, it fits right on you! Thanks Don! I really do love the fit! So beautiful! I love that peekaboo shot of you through the trees/leaves. I too have been trying to dress in lighter fabrics lately. Grabe ang init dito noh?? I’m SO not looking forward to the April heat lol. By the way, how do you blur the background in your photos? I noticed that almost everytime, everything else is blurred except for you. Is there a specific lens you have? Or a trick you do with the camera? Or do you edit your photos na lang with a program? I’d really love to know. I’ve been trying to achieve those kinds of shots with my Nikon but can’t seem to do it right haha. See your photos and dress makes me feel that spring has arrived. Spring is a beautiful season, and that the spring sunshine makes people feel warm. You was an angel of spring, that romper looks like a very simple and in fact there are some very good detail is exquisite. Appreciate! LOL! I know!! SO long! Thanks Nelayish! I have several denim jackets in my closet already but this one looks nice as well. 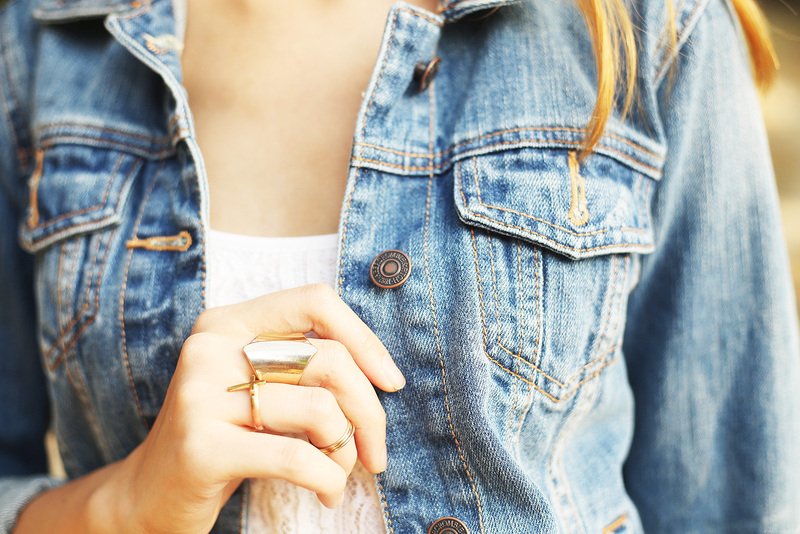 Can’t get enough of denim jackets haha! Denim is here to stay! :) Thanks Hanie! I love how the denim jacket matches the romper. I think I have to wear that same romper formy upcoming vacay! Ako rin, I’ll probably wear this on my vacation! so nice look, you are very lucky to have sun. Sorry to come later on your blog, I am very busy. Thanks Aurelie! I noticed your absence! Hope you get to relax soon! Love those rompers. Must have!!! And those shoes too! They’re not sky high but they are chic! uh oh too many exclamation points again. HAHAHA. Malapit na ang summer and its getting warmer by the minute. Happy exclamation points are welcome! :) Haha! I loooove it! I see two new stuff! Gaganda!!! Your bag looks heavy though. Is it? 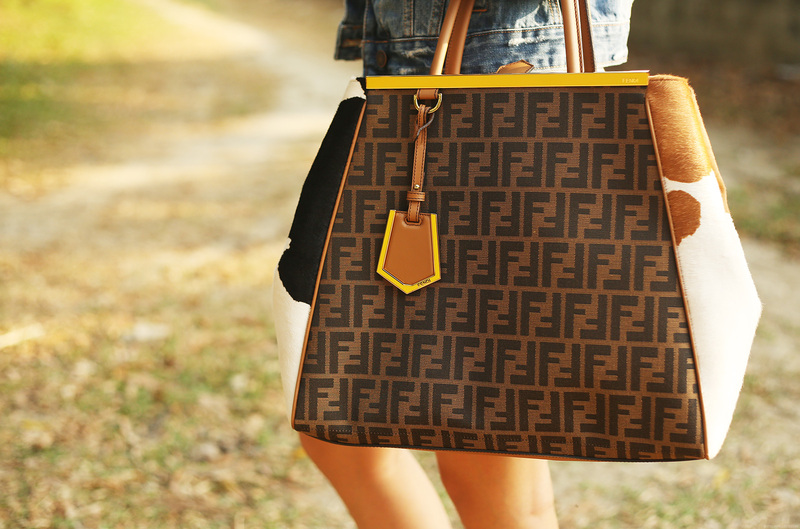 Grabe nagskip na naman yung heartbeat ko upon seeing your Fendi laying on the ground! Siguro kung OC to the highest level sis mo, masasabunutan ka nya pag nakita nya ‘to. haha! Ganda your Valentinos! Perfect for Summer! This is my kind of summer fashion! May tendency kasi ang iba to look tacky and slutty pag summer wear na ang ganap eh. Haha! Wala siyang masabi because it’s mine LOL! And really quick lang naman! :) The bag isn’t heavy. Normal lang :) Thank you Tasha! No to tacky! Hello. What’s the camera used in these photos? I was about to ask about the camera as well. These photos seemed different than your regular ones. I don’t know why, I’m guessing the light then. Love the denim jacket, by the way.